The southernmost extent of U.S. 231 travels 66.7 miles through Bay and Jackson Counties in the Florida Panhandle. A four-lane corridor throughout the state, U.S. 231 connects Lower Alabama and Interstate 10 with Panama City and resort areas west along the Emerald Coast. Beyond the Panama City area, U.S. 231 remains rural, passing through the settlements of Youngstown, Fountain and the small town of Alford. Through Jackson County, the highway connects with U.S. 90 in the town of Cottondale and Florida 2 in Campbellton. Angling southwest from Youngstown, U.S. 231 runs directly along side the Bayline Railroad to areas east of Lynn Haven and to U.S. 98 (15th Street) in Panama City. A PD&E Study conducted by FDOT developed improvements to address traffic congestion along this growing suburban corridor. The bulk of proposed changes are outlined for Segments 1 and 2. Projects advancing forward expand and rebuild a 5.5-mile section of U.S. 231 northeast from 15th Street to Pipe Line Road. Project Number 217910-7 upgrades 2.31 miles of U.S. 231, from U.S. 98 (15th Street) to a point north of State Road 368 (23rd Street), to a six-lane divided urban arterial. Work includes elevating U.S. 98 over both Jenks Avenue, the Bayline Railroad and U.S. 231 along Harrison Avenue. Dual left turn lanes will connect U.S. 98 east with a flyover leading to U.S. 231 north across Harrison Avenue. Flyovers will provide free flow movements from U.S. 231 south to U.S. 98 west and along the U.S. 98 eastbound mainline. Texas style U-turn ramps will be built along both U.S. 98 (15th Street) and U.S. 231 as well. A one mile section of SR 77 will be expanded from a five-lane boulevard to a six-lane urban arterial between U.S. 98 and SR 368 (23rd Street). This includes elevating SR 77 across U.S. 231 and replacing their intersection with a single point urban interchange (SPUI). These projects are funded for right-of-way acquisition and construction. Bids are expected in Fall 2023. Project Number 217910-8 further expands U.S. 231 northeast another 3.9 miles to Pipe Line Road. 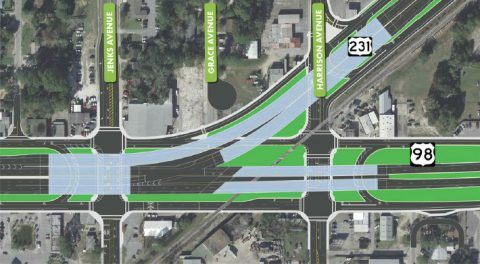 Work outlined here rebuilds U.S. 231 from a four-lane rural arterial to a six-lane urban arterial with bike lanes. Associated work widens one mile of SR 389 within the vicinity of U.S. 231 to a four-lane urban arterial. The FDOT Five_year Work Program funds right-of-way acquisition, but road construction is not funded as of 2018.